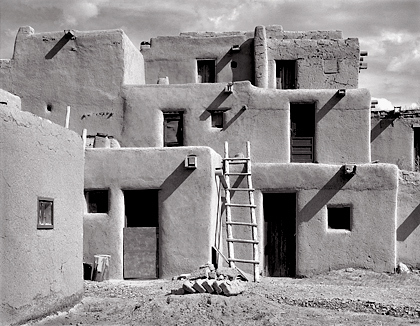 Taos Pueblo, an historic and photogenic indian town, lies at a high elevation north of Santa Fe, New Mexico. This structure is located in the historic dwelling of Taos Pueblo, a small community of tightly packed photogenic adobe buildings. Outside of the actual Pueblo, the rest of the town is literally filled with remarkable places of interest to the photographer. This photograph was taken along a back road in Taos Pueblo. The print requires a substantial amount of burning and dodging to balance the tonal values. A higher grade paper is necessary to accentuate the textures and forms of this flat-lit subject. I shot the image with a Pentax 6x7 camera on a tripod using Kodak T-Max 100 film. An orange filter was used to maintain good intrinsic contrast in the negative.